Tips, tricks, best practices and more about Microsoft Office Access and Visual Basic for Applications (VBA). Links to great articles and posts around the web plus some things I've learned that I'd like to share. In episode 5 we'll make the treeview really do domething. We'll use it to select records from the products and categories tables that we want to see or edit. The work you'll have to do in this episode is a little more than in the last two, but we'll go through it step-by-step. We're building on the work you've done in previous episodes. If you started in the Northwind database in episode 1 you'll have all the tables you need. If you're starting with the database you downloaded from the episode 4 page you'll have to add the Suppliers table from the Northwind database. When we're done, we'll be able to click on a category in our treeview and see the information about that category on our form beside the treeview, or click on a product to see the product details. 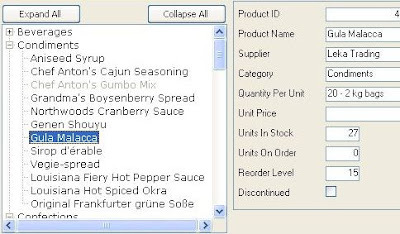 We'll use subforms to get the product and category information onto our form. So the first thing we need to do is create the subforms. For my database I let the wizard do the work. With the Categories table selected in the Access database window, do Insert/Form and select the Form Wizard option. 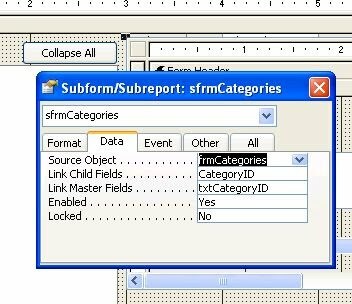 (Or in Access 2007 select Create/More Forms/Form Wizard). Select all the fields in the table. Save your new form as frmCategories. Do the same thing with the products table to create frmProducts. These will be pretty generic forms but they'll work for our purpose. Now we have to add the subforms to the form with the treeview. So open that form in design mode (mine is called frmMyNorthwindTreeview.) Find the subform/subreport tool on the toolbox and use it to add a subform. Specify that you want an existing form, and select the frmCategories we created above. When it prompts you for a name for your subform call it sfrmCategories. (It's a good idea to have the subform control's name slightly different than the name of the form used as a subform- I always name my subform controls starting with sfrm.) Add the subform anywhere you like- I added mine right beside the treeview. Do the same thing to add the form frmProducts to your form as a subform called sfrmProducts. Place it right on top of the categiries subform. In our code we'll adjust which one is actually visible based on the type of node that's clicked. Subforms can automatically show matching data, but they need a field or control on the main form that tells them which record to show. In this case you'll need to add text boxes for this purpose. We'll write code that will find the appropriate ID numbers and put them in the etxt boxes so the subforms know what data to display. Add a text box called txtProductID and one called txtCategoryID. Both are unbound, meaning they're not connected to fields in any table. Eventually you'll make these invisible, so Access can use them put users don't see them, but for now leave them visible so you know what's going on. Do the same thing for the subform sfrmProducts. The Link Child Fields property should be ProductID and the Link Master Fields property should be txtProductID. Nothing really complex here, but let's go through it. Take a look at the Sub's name. xProductTreeview_Click. 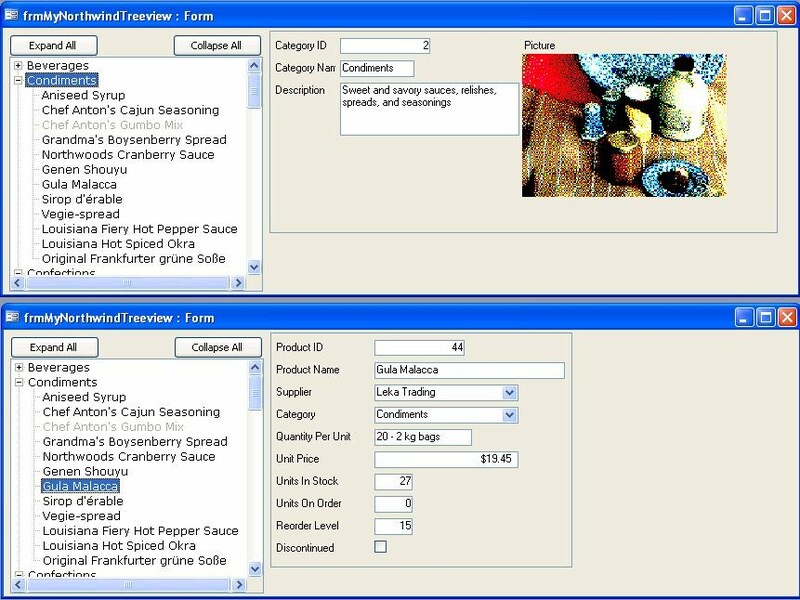 This is the On-Click event for the treeview control called xProductTreeview. Whenever the user clicks the treeview this subroutine will execute. The line starting with nodSelected gets the currently selected node and stores it in a variable- we'll use that a couple of times so might as well get it once and keep it. Next we use If...ElseIf...EndIf to check the beginning of the selected node's key so we know if it's a category node or a product node (or something else, just in case.). Once we know what it is we use Mid() to get the ID number part of the key and put that in the approrpiate text box. For good form we clear the other text box so that only one subform is showing data. And we make one text box visible and the other one invisible- remember that their over top of each other- whichever one doesn't apply should not be shown. To download the completed database from episode 5 click here. In Episode Six we'll start on a new treeview for customers and orders and we'll add images to the nodes! Before I found this blog, using Treeview control seems like something under scope of high-level programmer. Now I feel it get much familliar. I am looking forward next story. tree have become fun..thanks to u..but there is a issue ..if i am having a date validatin(eg.compare validator) then tree just expands once before validation and dies..can u help..
Do you have an example of a recursive routine for products (like a mult-level bill of material) -- products used to make higher level products? Please email me at dave.meyer@live.com. having problem withe the click funktion ! refrens not conected or ? In the Open Event of the Form, suggest both subforms have the Visible property set to False. This will prevent both subforms appearing/overlapped etc before the user clicks on the Treeview control. Up until I found this site, finding anything, anywhere about treeview controls was a nightmare. This site has literally changed how users interface with my database overnight. Fantastic alround. Hope you manager to write Episode 6, in an earlier comment you mentioned doing it about Pop up forms when you double click a node. Look forward to it! and Thank you. Thanks for the great feedback all! I'm glad you've found treeviews as fun to develop with as I have, and I'm glad I could help you navigate the mystery! Do let me know what you'd want to see in future "episodes". I'm going to make time to put at least a couple more up. Episode 6 will be a treeview with images for the nodes. The database is done and I just need to write the article! Anonymous: there must be a code library that your code references that the other users don't have access to. For instance it might be on your c: drive. From the VBA window on their PC go to Tools/References and look for a library that says "MISSING". Tried what you said and it worked. Thanks very much. One of the best references on the Treeview control I have ever found. Am currently having a problem with one of mine. My main form contains a treeview which is filled with activities. It also contains a subform with the activity details. On the subform there are several buttons that pops-up other forms. When one of these forms is opened (and it only happens with this one form), and then closed, the treeview inexplicably expands all of the nodes, but it only does it some of the time. I put a breakpoint on the cmd_Close_Click event, and tracked it through to the point where the treeview expands, and there is NO code that references the treeview in any way. I've used treeviews many times in the past (A2003 and earlier) but this is my first attempt to use it with an accdb file. I'm trying to fill a listbox from a treeview control. beautiful article, it made me able to use treeviews in my app with a very professional and good-looking effect, thanks! UtterAccess is the web's leading help forum for Microsoft Access. The community of Access enthusiaists who post there provide help to newbies and veterans alike, always in a friendly and supportive manner. Allen Browne's tips for Microsoft Access Allen Browne is one of the web's leading authorities on Access. Several of his articles are the standard reference for the topic at hand. Allen is also the most often cited cataloguer of Access bugs and the related work-arounds. The Access Web This site, established way back in '98, features tips and solutions from several Access MVPs. The code samples posted here are always clean and effective. Often you won't find a lot of text, but you will find code that works. The solutions here are cited all over the web as the best way to get things done. Stephen Lebans' site is the authority on the web for some types of solutions. It's a site every Access developer should know. You'll find tips, plus downloadable working solutions ranging from zooming images in and out, to disabling the mouse scroll wheel, to a calendar, to creating PDF files. In particular I look to Stephen's site first for advanced topics related to forms and reports, especially interacting with the Windows API. Candace Tripp's Utter Angel page is another often-cited resource. she posts simple working solutions for download. No Access/VBA links page is complete without Candace's page.